I haven’t posted a pictorial update for our backyard garden in some time, so here are a few photos that should catch us up to Labor Day weekend. This bed, which gets a lot of shade thanks to the grape vine, had several rows of shell peas and onions in it; once we removed those, pretty much all that was left was our wall of runner bean, two small broccoli plants that may or may not get large enough to produce before the first frost, and two rows of transplanted purple carrots that barely even had roots in June and are now thriving. 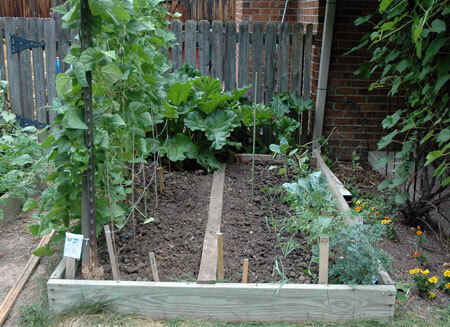 On Labor Day, I planted a row of spinach and another of Dwarf blue kale where the peas came out, and put in a half row of spindly leeks transplanted from the community garden; the leeks seem to have survived the uprooting, and the seeds have all started sprouting. This bed has had a busy summer. At left you can see the bottoms of the scarlet runner beans, which have grown so tall I almost can’t reach the beans themselves. The back of the bed is dedicated to pickling cucumbers, which have given us pounds and pounds of cukes with more on the way. The right hand side is full of root veggies, two rows each of carrots and beets, some of which have recently reached the size to harvest. There is also a row of spring onions (or scallions) in the center that have reached a pretty decent size; I pull those up as I need them, and the rest stay fresh in the ground. Over the long weekend, we put in a row and a half of more transplanted leeks, as well as a row of baby bok choi, which is sprouting vigorously. 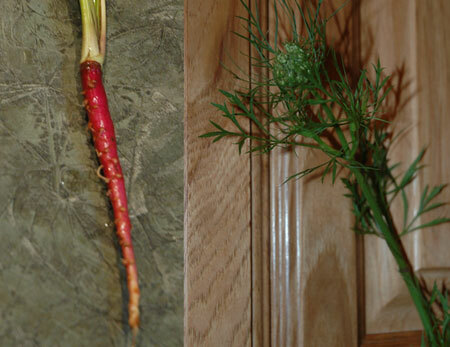 One of the aforementioned purple carrots bolted, which is a little weird since carrots are biennials and therefore shouldn’t flower until the second year. It was the only one to do so, though; a fluke, I suppose. 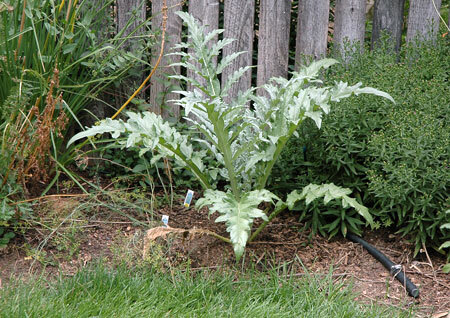 My artichoke plant is growing nicely, but we may have planted it too late in the spring to get any artichokes from it this year. 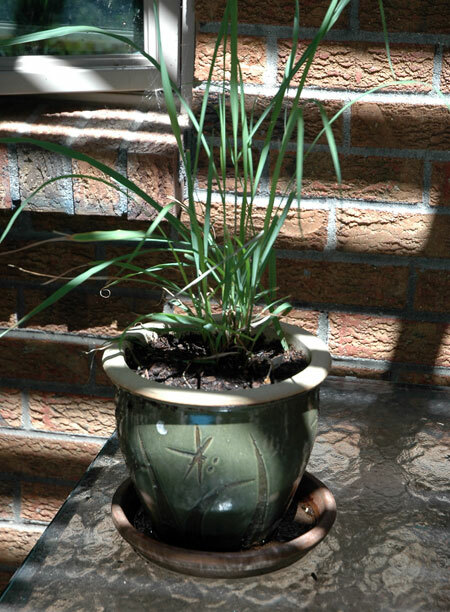 With any luck, it will survive the winter and come back next year with lots of buds. The herb garden, full of huge pepper plants and bolting arugula. 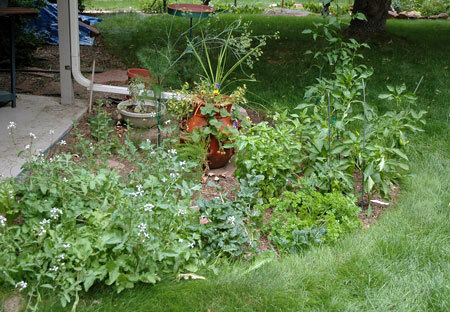 My perennial herbs are definitely not getting as much sun as they would like, so next spring I may do some rearranging; I suspect greens will do well on the shady side of the bed. The 3 varieties of basil are very happy, though, and the asparagus has taken hold nicely. We even have one pepper plant that grew large enough from seed to start blossoming last week, and may give us some peppers yet! 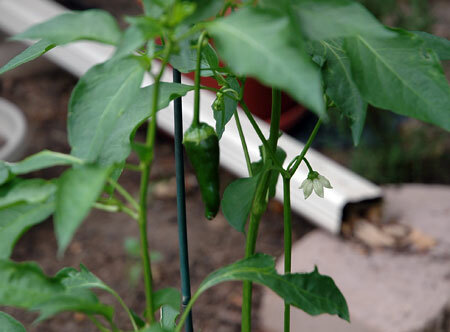 This is the first poblano pepper we have actually gotten to start growing. For some reason, the plant itself grew up to almost 4 feet tall, but all the blossoms just fall off instead of producing peppers. Hopefully, that trend is over and we will get a few good ones before the end of the season. 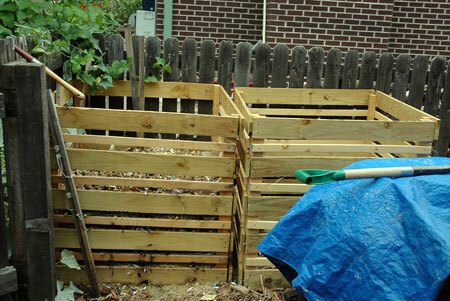 I haven’t yet shown you a photo of the compost bins my dad built this past month. They are doing the trick beautifully, and the first bin is two-thirds full already, between garden trimmings, kitchen scraps, and the rough mulch we get for free from the city. Once it is full, the front of the bin comes off so that my dad can turn the compost into the second bin for further decomposition into humus. So far it is a big bug attractor, but doesn’t smell funny and hasn’t burst into flames, so we have to assume good things are happening under there somewhere! 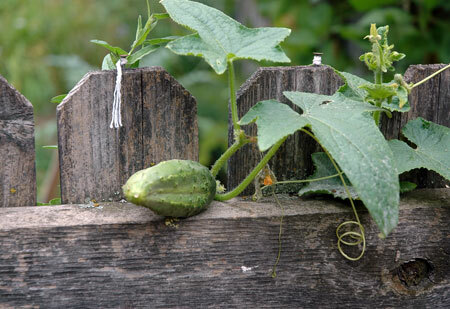 Just a fun shot of the cucumbers, which have climbed the fence between their bed and the compost bin and started setting fruit on that side. 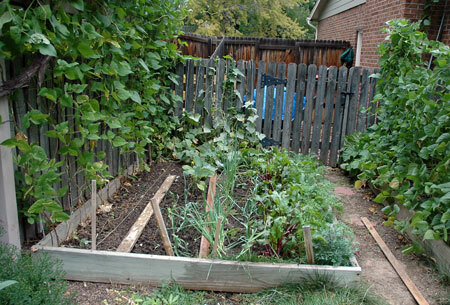 Next year I hope to run chicken wire from the raised bed up and over the fence, to give them a little more support than string trellises and hopefully prevent all the overripe cukes we keep missing because they are growing down behind the bed and under all the leaves.